Artist and papermaker William Joseph “Dard” Hunter (American, 1883–1966) embraced the American Arts and Crafts movement and esthetic, and became one of the most influential designers of the early 20th century. At age 21, he talked his way into a summer job at the famed Roycroft art colony in East Aurora, New York where he remained for several years, thriving under the influence of founder Elbert Hubbard. Hunter’s iconic designs translate beautifully into a variety of stationery items, all of which will reflect your good taste. 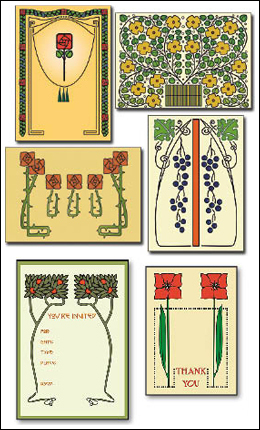 The notecards (box of 20 - 5" X 7" blank cards w/envelopes) feature 5 each of 4 designs adapted from book covers and interiors. The invitations (box of 12 - 5" X 7" cards w/envelopes) are adapted from the title page of a Roycroft catalog. The thank you notes (box of 10 - 3-1/2" X 5," notes w/envelopes) are adapted from 1908’s "The American Home.